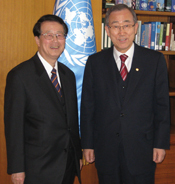 IUPAC President Jung-Il Jin (left) with UN Secretary General Ki-Moon Ban at UN Headquarters in January 2009. IUPAC President Jung-Il Jin spent much of January 2009 travelling the globe to publicize and plan for the celebration of 2011 as the International Year of Chemistry, which was proclaimed by the United Nations General Assembly on 19 December 2008. After meetings in Cairo and Frankfurt, the most notable stop on Jin’s tour was a meeting with UN Secretary General Ki-Moon Ban on January 17 at UN Headquarters in New York City. During the meeting, Jin thanked Ban for his cooperation and help in the promulgation of the IYC proclamation and took the opportunity to explain the history of IUPAC and its recent activities. The secretary general stated that aside from the UN Educational, Scientific, and Cultural Organization (UNESCO), the Department of Economics and Social Affairs (DESA) is the best suited UN department for IUPAC to work with in many areas, including sustainable development. Jin asked Ban if he would consider delivering a special lecture at the August 2011 IUPAC General Assembly and Chemistry Congress, to be held in San Juan, Puerto Rico. Ban has demonstrated an understanding of the importance of basic sciences and also a keen interest in environmental protection, energy-related matters, and preservation of natural resources. According to Jin, the secretary general responded positively to the invitation. IUPAC President Jung-Il Jin (left) meets with Nikhil Chandavarkar of the UN Department of Economics and Social Affairs. IUPAC should take steps to become an accredited NGO of the UN Economics and Social Affairs Council. IUPAC and DESA should arrange a formal meeting to discuss the future cooperation. According to Jin, his meetings made it clear that IUPAC can work with the UN on a broad range of issues in addition to the IYC. Temechegn Engida, President of FASC (left), with IUPAC President Jung-Il Jin in Egypt in January 2009. From 4–6 January 2009, Jin joined IUPAC Secretary General David Black in Cairo for meetings of the Federation of African Societies of Chemistry (FASC) and Arabian Chemical Societies. Following introductory remarks by Ahmed Galal, dean of the Faculty of Science, Cairo University, to begin the FASC Chemical Congress, Jin gave a brief introduction about IUPAC and noted that the organization currently has close to 75 regular and associate members. He stressed that IUPAC is aiming to increase its membership to 100 countries by 2019, which will be the hundredth anniversary of IUPAC. He urged all participants to help IUPAC achieve this goal, pointing out the importance of recruiting more members from African and the Arab states. Shortly after the UN proclaimed the year 2011 as the International Year of Chemistry, IUPAC called for a meeting of presidents and other representatives of EuCheMS (European Association for Chemical and Molecular Sciences) member organizations. On 9 January 2009, Jin met up with IUPAC Vice President Nicole Moreau, IUPAC Executive Director John Jost, and David Black for such a meeting at the headquarters of the Gesselschaft Deutscher Chemiker (GDCh) in Frankfurt. GDCh President Klaus Müllen opened the meeting by welcoming participants (see group photo google IYC Frankfurt) and briefly describing the Year of Chemistry celebrated in Germany in 2003 (see May-June 2004 CI, p. 4). This had been a very successful event with extensive coverage in the general media. He expected that the GDCh would be able to replicate that success with the IYC in 2011. Jin expressed his appreciation that representatives of so many major European chemical societies could come to the meeting and thanked Müllen and the GDCh for helping to organize it. Jin observed that the IYC Management Committee had representatives from IUPAC and the regional chemistry federations, EuCheMS, Latin American Federation of Chemical Associations, Federation of Asian Chemical Societies, and Federation of African Societies of Chemistry, as well as the International Council of Chemical Associations. John Jost reported that the World Chemistry Leadership Meeting to be held in August 2009 in Glasgow during the IUPAC General Assembly would have as its theme the International Year of Chemistry. The meeting would be used to promote cooperation among chemical societies and others, such as industry organizations, in planning for the IYC. It was expected that this would be an opportunity for organizations to share their plans and to provide inspiration for events that could be held nationally and locally as well as to inform the participants about IUPAC’s plans for major international events. Black reported that the PACIFICHEM conference to be held in Honolulu, Hawaii, in December 2010 would be used as a pre-launch publicity event to announce the IYC in advance of the official launch of the IYC in Paris on 27–28 January 2011. This was viewed as an excellent opportunity because of the large number of participants at this conference from both North America and the Asia-Pacific region. Leaders gather for the EuCheMS meeting in Frankfurt, 9 January 2009. Seated (from left), Nicole Moreau (IUPAC vice president), Luigi Campanella (Italy), Paul Baekelmans (Belgium), Malgorzata Sobieszczak-Marciniak (Poland), and Janusz Lipkowski (Poland). Standing (from left), David Black (IUPAC secretary general), Olivier Homolle (France), Peter Kündig (Switzerland), Lukas Weber (Switzerland), Klaus Müllen (Germany), John Jost (IUPAC executive director), Jung-Il Jin (IUPAC president), Jose Manuel Pingarron (Spain), Jan Apotheker (Netherlands), Pauline Meakins (United Kingdom), and Kurt Begitt (Germany). Nicole Moreau briefly reviewed plans for an opening event in Paris in January 2011. The event would be organized in cooperation with UNESCO. There was some discussion of the kinds of events that might be part of the launch of the IYC. It was agreed that it was important to try to communicate the excitement of chemistry. Jin reminded the participants that the success of the IYC depended on the national chemical societies and on national and local events. Events directly organized by IUPAC would in practice have only a limited impact. In the ensuing discussion a number of the participants described their plans to reach out beyond their chemical societies to the broader chemistry community. It was emphasized by a number of speakers that the chemistry community included many who did not normally think of themselves as chemists, but who were in fact involved in the use and application of chemistry. It was also noted a number of times that it would be necessary to involve the chemical industry and not to view the industry only as source of funds. Page last modified 23 April 2009.